Marketing operations is often a complex infrastructure of multiple systems that enable many processes across marketing departments, often pulling in data from other functional areas of the business. Part of the challenges those in marketing operations face is ensuring those systems are integrated when appropriate and that they are providing the necessary transparency and efficiency required for a successful marketing organization. Because there is an increasing need for marketing to prove their value in contributing to revenue, marketing operations is a critical component of any marketing organization striving to be viewed not as a cost center but as a revenue producer. Ensuring all of the systems are efficient, processes are standardized and performance is measured requires expert coordination but without the right tool, marketing operations can become bogged down with spreadsheets and disparate data. What marketing operations needs a single solution that brings all of the data into one place. 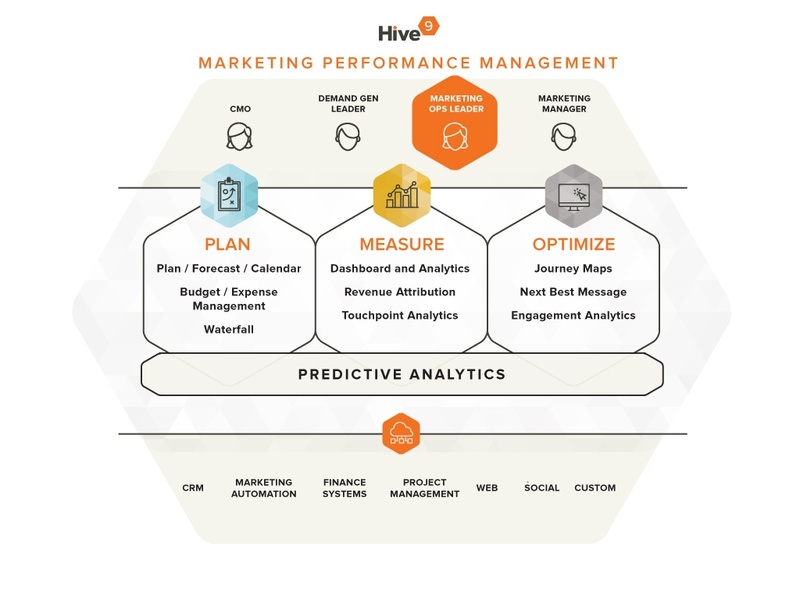 Hive9 enables marketing operations to use one system with always-on intelligence and productized connectors to other business systems, such as CRM, marketing automation, finance, and project management. When all of the data is integrated in an intelligent way, it becomes easy to see wins and report that information to demand generation leaders so they can see which campaigns are working and which are not. Processes are transparent and consistent, driving operational efficiencies that not only enable best-practice marketing practices but directly impact revenue. When systems are integrated and processes are streamlined and efficient, there is less risk for manual errors, duplicative efforts, campaigns running on bad or old data, and blown budgets and timelines. Hive9 is the only marketing performance management solution that gives marketing operations a simple way to manage systems and processes. Hive9 helps marketers work more efficiently and demonstrate their value quickly. If you are ready to bring order to marketing operations and provide measurable value to the business of marketing, it’s time you look at Hive9.